BMW Destruction! From Decent Car To SCRAP METAL In A Minute! There comes a time when we just have to let our vehicle go. We could sell it and hope that the other owner will take care of it, or we could take it to the automobile graveyard. We think that it is better to choose between these two than to leave it to rot. But there are millions of characters out there, and it is completely understandable if somebody does not agree with us. Anyway, the BMW Destruction video we have prepared for you today features the second of the aforementioned options of ours. All in all, as car lovers we find the destruction of this nice BMW a little bit brutal, but sometimes life gives you such moments. In fact, it is the owner`s decision to take the car to the automobile graveyard and turn it into a pile of metal. Anyhow, check out the immense power of the machine that literally wrecks the BMW. The most amusing part, according to us, is when the powerful machine is trying to demolish the engine. It struggles a bit but manages to separate it from its natural position and then just keeps crushing the car while holding the engine. 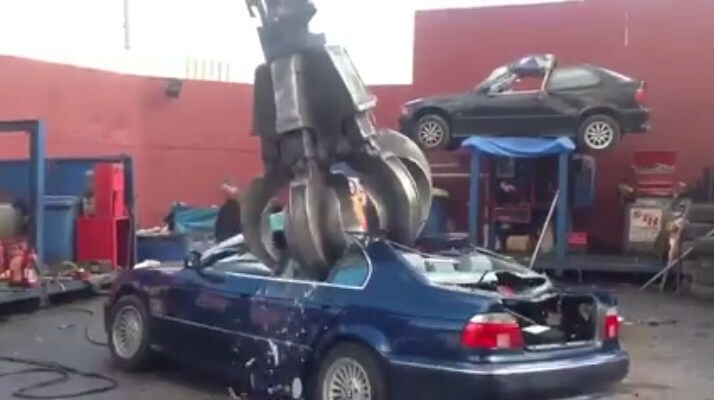 Would you dare to watch your car being destroyed like this BMW Destruction? P.S. Click here to watch the 10 best car destruction videos.